The Greater Portland Council of Governments and other groups will get results with state support. The cities and towns of the Portland area, from Sebago Lake to Casco Bay, are working together to reduce taxes and provide security and prosperity to everyone. Municipal leaders work every day to make life better for businesses and residents. But no single town or city can do it alone. Municipalities have more power when they work together as a region. Ecomaine is one example of how cities and towns in Greater Portland collaborate to provide a service. There are many more possibilities. Chris Hall leads the Greater Portland Council of Governments’ advocacy and public policy work. Gov.-elect Janet Mills and the 129th Legislature have the opportunity to create a supportive environment for regional collaboration, allowing municipalities to lay the groundwork for increasing revenues, lowering taxes and ensuring we grow in places that make sense and preserve natural areas – measures that will attract and retain tourists, businesses and young people. 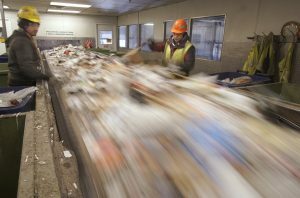 The 25 cities and towns that are members of the Greater Portland Council of Governments have achieved a lot through collaboration, like founding ecomaine for shared recycling and consolidating public safety dispatch services through Cumberland County government. We’re currently working with 13 municipalities to buy and share a municipally owned line-striping truck so that we can paint better road stripes for less money. • Address the opioid crisis. We are piloting an effort to teach our region that opioid addiction is a treatable disease, not a moral failing, and will support the state’s efforts to address the opioid abuse crisis by expanding access to treatment. • Improve transportation choices. We can improve public transportation by launching a new, electronic fare system, coordinating scheduling and better promoting options to the public. We’ve got a good network of buses, ferries and trains in our region, and with support, it can be great. We also need to help our residents age in place by providing better mobility options in rural areas so older people can access health care. We need to work together to attract large-scale federal funding for transformational transportation projects. Roads defined the 20th century – what transportation infrastructure or technology will define the 21st? • Expand housing choices. We can empower local governments to address the housing crisis confronting us all with new policies to add new homes for our workforce and older people in places that make sense. This will ensure that we develop less in our natural areas. • Plan for a changing climate. Our region needs to be economically and environmentally resilient. State policies can help our region look ahead to the anticipated economic and natural disruptions caused by climate change and plan for them before they happen. Changes are coming – how we respond regionally will shape our future. • Lower property taxes. We have a variety of strategies, including voluntary consolidations, collective service delivery and new technologies to reduce the burden on taxpayers for government services. Every regional action has the potential to do things faster, more efficiently and more effectively. That saves money. • Protect water quality. Funding regional technical assistance to local planning boards and municipal staff will help our citizens be more effective stewards of our environment, and protect the water in our lakes, rivers, and Casco Bay. Regional strategies save tax dollars, pull together communities across local boundaries and help us think big. The Greater Portland Council of Governments is just one of many regional organizations in Maine that will get great results if state government supports regional action. What’s needed in 2019 are new partnerships with state government that unlock the full potential of regional action in our part of the state and all across Maine.